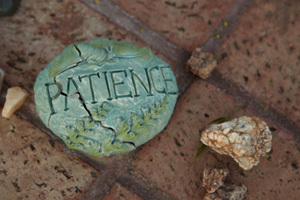 Impatience is a disadvantage when it comes to our spiritual lives. As spiritual companions, we witness this firsthand in ourselves and in others. We may long to possess a saint-like inner landscape. We may become harsh and judgemental with ourselves when we do not make the spiritual strides we’d hoped. but that is where the labour ends. We must turn the results of our labours over to the Universe.